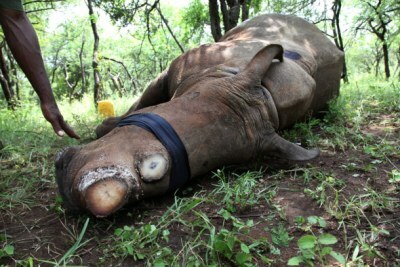 Throughout elephant and rhino range, the growing risk to these emblematic flagship species is palpable. Focused interventions and dedicated action are needed to prevent the threat of extinction of vulnerable populations in the face of intensive, ongoing poaching and illegal trade. The extensive involvement of transnational criminal networks, most with one foot in Africa and the other in Asia, presents a huge challenge. Successful wildlife trafficking of ivory and rhino horn increasingly relies upon the use of sophisticated technology and techniques for the movement, avoidance of detection, marketing of contraband and the laundering of monetary rewards of illicit trade. To address these issues, the global response needs to become equally professionalized.